As construction at Hudson Woods progresses, with foundations being poured at lots 14 & 19, we would like to convey some compelling facts about our site work. Our land use strategy includes utilizing raw materials from the property to create finished products. 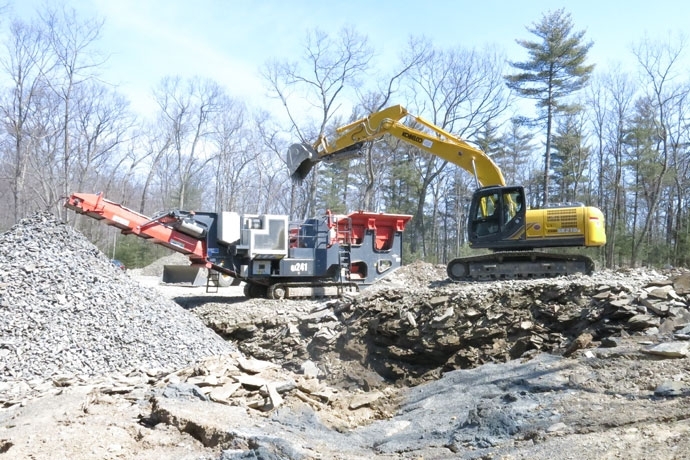 Gravel used to construct roads and driveways at Hudson Woods is being made from stone on the property. The stone is mined as a byproduct of excavation work already taking place for our house foundations and storm water retention ponds. The roads have a 12 inch base consisting of large gravel pieces, which are then covered by 6 inches of finer “Item 4” gravel. Much of the stone at the Hudson Woods property is Bluestone, a beautiful material characteristic of vernacular Hudson Valley architecture, and familiar to many people due to the abundance of stacked stone walls throughout the Hudson Valley landscape. Mining bluestone at the property means we don’t have to truck in stone and gravel required for our construction. Our approach results in reduced emissions, and substantial saving on diesel fuel and material costs. Road work at the property alone requires 36,000 tons of road base and Item 4 gravel, which would require 1,300 truck trips or 65,000 miles, and 13,000 gallons of fuel had we followed a conventional path of construction. An important benefit of our approach is that cost savings are extended to home buyers, as represented in hour home and upgrade pricing.